I purchased the DB-DS-120, I have onl6y used it a few times. 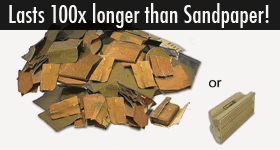 The disc sands very aggressive, much more than a regular sanding disc, It took less time to sand. Looking forward to a long disc life. I plan on purchasing a courser grit in the near future. These Dura-Grit sanding discs are the best thing ever to happen to sanding. I an building a woodstrip boat out of African mahogany which is extremely hard. I had been trying to sand the hull with a belt sander and regular random orbital sanding discs. After 2 full days of sanding I was getting very discouraged thinking all my work was going to end in a poor finish. After receiving my Dura-Grit discs I was able to sand the hull to a very good finish in only 2 1/2 hours and the disc still looks like new. I cannot begin to count how many sanding belts and discs I wore out and how many hours it took to do it. After round 1 with a coarse disc I was so impressed with the discs that I ordered fine discs to finish the job. I am very pleased with the tools I have purchased. They have and I am sure will continue to perform as advertised. I appreciate the durability and versatility of the tools. I have found that in the case of the rotary sanding disks that heat is detrimental to the durability of the velcro attached disks. The disk on the sander is inferior and I need a solution that will hold up to the heat generated when sanding. If you have any ideas that would help it would be most appreciated. This is a common issue with the velcro hook installed on some commercially available orbit sanders. They are not suitable to hold onto our steel backed carbide sanding disc. DuraGRIT listened to customers and now include with every sanding disc a free replacement heavy duty hook and loop conversion kit to overcome this problem. Joel was the first to receive this heavy duty hook replacement.